The Validity of the Chilcot Inquiry. Its failure to be Impartial within European Human Rights Law. If ever there was a geo-political bombshell, this is it. Twelve years after the illegal and inhumane invasion of Iraq based on lies, fabrication and downright arrogance, 6 years after the launch of the Chilcot inquiry, comes today the following allegation. For those who have followed the Iraq story, a must read. Following the meeting of the Foreign Affairs Committee on 4th Feb 2015 concerning the Chilcot Inquiry, which was unsatisfactory in not establishing a completion date, I shall be grateful if you will investigate a much graver matter concerning the validity of the Inquiry as a whole. That is its failure to be impartial within European Human Rights Law. Sir Lawrence Freedman was appointed Privy Councilor as Adviser to PM Tony Blair on Foreign Affairs, in the period from 1997-2007. He has also formed a company with the MOD to train the military and businesses in military strategy. I contend that these positions are incompatible with his membership of the Chilcot Inquiry. “Jonathan Powell will be giving evidence today. I thought it would be helpful to set out, for the record, my involvement in Prime Minister Tony Blair’s speech, delivered to the Economic Club of Chicago on 24 April 1999 on ‘The doctrine of the International Community. Now of these submissions there were, in fact, twelve paragraphs included in Blair’s speech verbatim. The wording, in turn, is reminiscent of statements two years earlier to be found in The Project for a New American Century, PNAC, written by Wolfowitz, Perle, Rumsfeld, Bolton, and Cheney. ( All committed zionists, as is Freedman.) Freedman must have been aware of the PNAC, and may, as a war strategist, have met its authors and even contributed to its ideas, if not the actual words. Recently, in 2010, he did indeed share a conference platform with Richard Perle, again compromising his role as an impartial member of the Chilcot Inquiry during its progress from 20069 and 2015. The Blair Doctrine was delivered by Blair in Chicago two years before Bush was elected as President, and eleven months before 9/11. Blair had of course been groomed in America as a young, charismatic, potential leader in the late 1980s and early 1990s with Fulbright International Travel Scholarships, along with Karzai and Gordon Brown. ( Tony Benn was convinced Blair was a CIA instrument in smashing the Labour party.) The PNAC push to deal with Saddam Hussein had come long before Bush was elected President. As Sir Christopher Meyer said to the Chilcot Inquiry , Blair was ” a firm believer” in removing Saddam Hussein long before 9/11. In Blair’s own words …”I had a vision … greater than Iraq , greater than the American Alliance, greater than the greatness of our history.” There was no stopping him . ( cf ” A Journey “p 500 – 501). 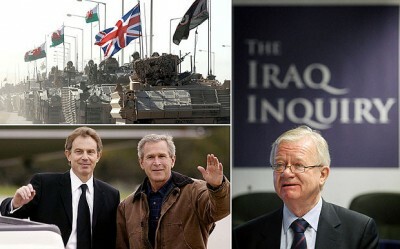 Sir Jeremy Greenstock, who gave evidence to the Chilcot Inquiry on its second day, closed his remarks as he was leaving, ” in our conversations ( a clever word) I was surprised you did not mention Israel.” Certainly the PNAC authors were very concerned to stop Saddam paying the families of Palestinian suicide bombers, as was Freedman. The second part of my letter deals with the possible deception by Chilcot himself, and, according to European Human Rights Law, the lack of validity of the Inquiry because it can not be considered impartial. This lack of validity will cause extreme distress for Military Families Against War, as it is contrary to the protection given by European Human Rights Law to enable those affected to be confident that they can obtain an unbiased hearing. Rose Gentle will be staggered that she will never obtain justice for her dead son because the Chilcot Inquiry is rubbish. Nor will all the Iraqis ever be compensated whose relatives and children have been killed, maimed and psychologically damaged in the wreckage of a country in civil war. The fact that the barbarian acts of Lindsey England with her cigarette pointing at the penises of naked Iraqis at Abu Ghraib or the sexual torture ( “work them hard”) in Camp Bread Basket will never be exposed in the International Criminal Court along with The Leaders of the war ( whose actions lead to all others), will be a stimulus to continuous violence in the future, as the Joint Intelligence Committee prophesied in the year 2000. When in a letter of of 3 March 2011 I challenged Sir John about the Freedman Letter, his secretary replied that he had known about this “a long time before”. “and had full confidence in the balance of his team”. But how long before ? (Cicero in a speech in praise of Pompey used this same legal ambiguity) Was it 24 hours before? Was it written in panic ? Was it 2 months before? or at the commencement of his Inquiry in Nov 2009? Sir John also made clear that the Inquiry team would be critical if they felt it necessary. “We are all committed to ensuring that our proceedings are as open as possible because we recognise that is one of the ways in which the public can have confidence in the integrity and independence of the inquiry process. How was he able to allow the official Inquiry Biography of Freedman, (which I quote below) still to omit in 2009, and still go on omitting in 2015, without alteration, the fact that Sir Lawrence Freedman was Foreign Affairs Policy Adviser to Blair between 1997 and 2007. Sir Lawrence Freedman has been Professor of War Studies at King’s College London since 1982. He became head of the School of Social Science and Public Policy at King’s in 2000 and was appointed Vice-Principal in 2003. He was educated at Whitley Bay Grammar School and the Universities of Manchester, York and Oxford. Before joining King’s he held research appointments at Nuffield College Oxford, IISS and the Royal Institute of International Affairs. He was appointed Official Historian of the Falklands Campaign in 1997. Professor Freedman has written extensively on nuclear strategy and the cold war, as well as commentating regularly on contemporary security issues. Among his books are Kennedy’s Wars: Berlin, Cuba, Laos and Vietnam (2000), The Evolution of Nuclear Strategy (3rd edition 2004), Deterrence (2005), the two volume Official History of the Falklands Campaign (second edition 2007) and an Adelphi Paper on The Transformation in Strategic Affairs (2004). A Choice of Enemies: America confronts the Middle East, won the 2009 Lionel Gelber Prize and Duke of Westminster Medal for Military Literature. His most recent book is Strategy: A History (2013). as Foreign Affairs advisor to PM Tony Blair from 1997 to 2007. Freedman contributed twelve crucial paragraphs, including removing Saddam Hussein, to “The Blair Doctrine” delivered to The Chicago Economic Club in April 1999, a year and a half before 9/11. I understand that while the Chilcot Inquiry has been in progress Freedman has been Professor of War Studies at Kings College London and has recently supervised a Phd study at Exeter on Israeli counter terrorist strategy and IDF War strategy. He has written a number of Papers on Israeli IDF anti terrorist strategy. He has written papers on the value of nuclear deterrence. He has set up a private company Simulstat with close association with the MOD teaching strategy to military and business at Cranfield and Shrivenham.. Such a close association with the MOD would make it hard for him to be critical of the MOD . As Professor of War Studies he must know the Nuremberg Protocols of 1946 and the 40 Blue Books produced from Courtroom 600 Nuremberg and that planning and executing an aggressive war was considered “the supreme international crime of all “punishable by death. In a public hearing it would only be human that Sir Lawrence would wish to distance himself from his master Tony Blair and the strategy of regime change, which as Foreign Secretary Jack Straw said “he had advised the Prime Minister on numerous occasions was palpably illegal”. One begins to wonder if, in Sir Lawrence Freedman, one is not dealing with Mephistopheles himself . He has managed to inveigle himself into the position of being both Judge and Jury of his own actions, and to manipulate as a puppet a man less clever than himself. We will never know the truth of the first week of Shock and Awe, how little Ali’s burnt body came to be scarred with with charcoal flash marks like Hiroshima plutonium. We will never know of the mother in Fallujah staring at her beautiful child with a huge cancer on her face and of mothers, giving birth to babies with one eye, and their innards carried outside their bodies, whether the MOD knew all along that the munitions used with depleted uranium and plutonium would cause these tragedies, because Freedman himself was advocating the use of nuclear weapons and was himself negotiating with the MOD to form a company from which he would benefit. We do not know if Freedman himself copied terms such as Shock and Awe ( Sturm und Drang ) and |Storm Shadow Missiles” (Sturmtruppen ) |from Nazi Germany because the whole Inquiry is rotten to the core . We will not know if Freedman is in touch with Blair’s lawyers extending the maxwellisation Programe by deceit ad infinitum.. I therefore request that you investigate the impartiality of Sir Lawrence Freedman and whether the Chilcot Inquiry should quickly be brought to a close as not complying with European Human Rights Law. Maxwellisation could clearly go on for a very long time indeed without a conclusion. I suggest that on the morning of Jonathan Powell’s appearance Freedman must have been very worried indeed that the cat might have come out of the bag. Perhaps the Committee was instructed by Chilcot to steer clear of these speeches when questioning Powell. I shall be pleased to forward to you copies of the many letters I have received from Sir John’s staff. While writing this letter to you , Bassim an Iraqi Sheik, to whom I tried to teach English , lost his nephew and youngest brother who were killed in Baghdad. He has now lost all the male members of his family, since his brother was killed, while hooded, by the Americans , and his brother in law by the Shia Militia. You could never meet a kinder or more intelligent man than Bassim. I dedicate this letter to him. \Secretary to The Blair War Crimes Foundation. cc Mrs Rose Gentle, Military Families Against War .